Our friends Candy & John from California left on Saturday morning after a terrific week of wine, food, and fun. On Thursday, we did our traditional holiday meal of roast leg of lamb and flageolets (beans). I don't have a photo of the beans for some reason (it might have been the wine). A starter of pumpkin and goat cheese ravioli. The lamb came from a local St.-Aignan butcher who skillfully trimmed it all up to order and even told us how long and at what temperature to roast it for the best outcome. He was right on; it was tender and just barely pink inside. 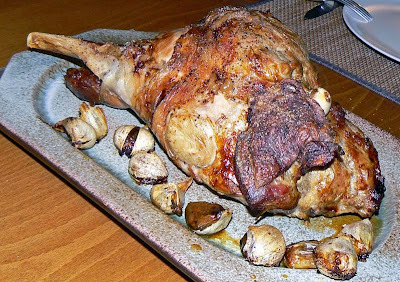 The leg of lamb is served with roasted garlic. 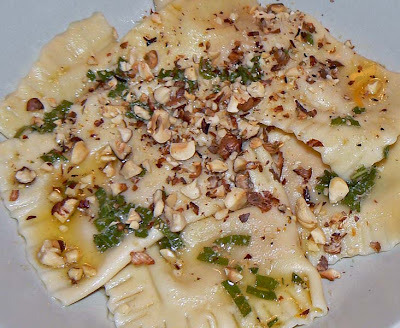 As an appetizer, we ate pumpkin and goat cheese raviolis topped with sage butter and ground toasted hazelnuts. This is the third time I've made raviolis since September. I made this batch on Wednesday afternoon and cooked them halfway, then stored them in the cellar overnight. All I had to do on Thursday was to finish them off in boiling water then add the sauce. Fresh apple tart for dessert! 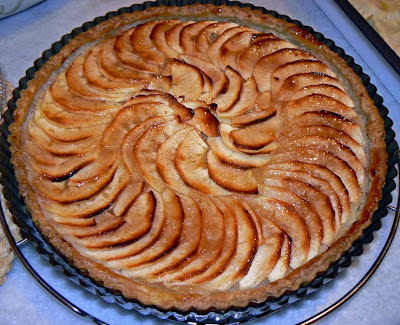 We had an apple tart for dessert, which is standard fare around our house. This time I put ground almonds and applesauce under the sliced apples and glazed the pie with apple jelly. 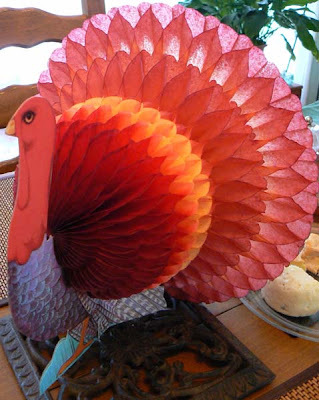 While we ate lamb, we did have a turkey on the table. Candy brought this guy all the way from California. There was a lot of home grown stuff on the table. I grew the beans in our garden this summer. We dried the last harvest and shelled them for Thanksgiving day. Ken added some of the whole green beans that we had picked and frozen during the summer. The pumpkin for the ravioli was also grown in the garden, and the apples that went into the pie, applesauce, and apple jelly all came from our trees. The sage and rosemary that went into dinner also came from the back yard. On Tuesday, our house guests and we drove over to Montlouis and Vouvray on the Loire. These two towns are known for their particular appellations within the Touraine wine region. They make white wines with the chenin blanc grape. 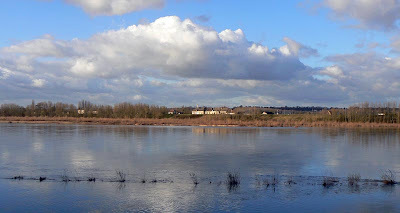 The Loire river at Montlouis, a wine town on the left bank. Vouvray is a few kilometers down river (toward the left in this photo) on the right bank. The variety of wines runs from dry (brut or sec) to sweet (demi-sec or moelleux) and includes both sparkling and still wines. We visited three producers: Chidaine in Montlouis, Huet and Aubert in Vouvray. Aubert is one of our favorites for sparkling Vouvray. We discovered them in 2000 when we were here on vacation. It's totally unpretentious, welcoming and friendly, and the prices are very low considering the quality of the wines. We now visit them at least once a year to stock up on their wines for the holiday season. 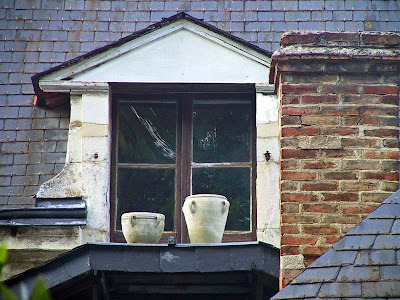 These pots were sitting on a window sill in Richelieu. I'm sure that in summer, they're planted with something colorful like geraniums. Pots on a window sill. This picture, however, was taken in the fall, and the pots were empty. I think many people take their geraniums in for winter and put them back out again in spring. Still, it's not unusual to see geraniums in window boxes right up until a freeze hits. Well, let me be more specific. I wish it was hot and summery like it is when one goes camping. Ken and I did a good bit of tent camping when we lived in California. I think that Yosemite was one of our more frequent destinations, but we also camped in other parts of the northern Sierra, several times on the coast, in Nevada and Utah, Death Valley, and the southern desert near Palm Springs. Morning coffee by the fire. The truck is not mine. Ken was a reluctant camper at first, but he was a good sport and eventually got into it. We nearly always had our dog Collette with us, too. I got back into camping (which my family did every year when I was a kid in upstate New York) because of our friend Sue, who just loves it. Her favorite place is Yosemite, but she goes camping all over northern California, Nevada, and beyond. She lives in the Sierra foothills. 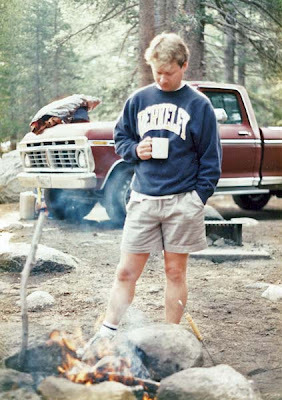 This is a photo of me when I was in grad school, camping at Tuolumne Meadow in Yosemite National Park. I think the year was 1991. Great memories! Our tent in the back yard. 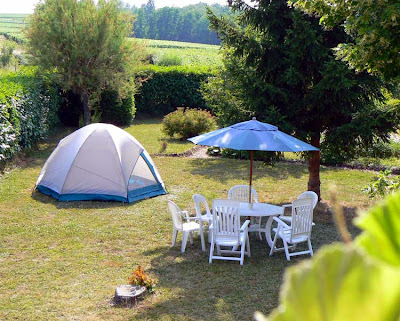 We moved most of our camping gear to France with us, but the only use it's gotten so far has been in the back yard. Ken has mentioned more than once that we should go camping somewhere in France soon. A true convert! 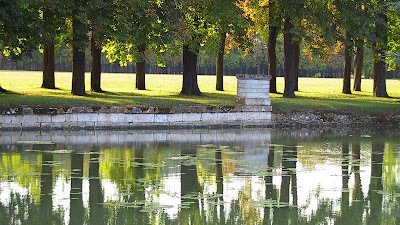 I took this photo on the grounds of the former château in Richelieu, a town on the edges of the Touraine created by and named for the infamous cardinal. A September day in central France. Richelieu is a seventeenth century town built on a rectilinear plan. The château, which stood just outside the the town's moat, was demolished after the French Revolution, but the large park remains and is open to the public. 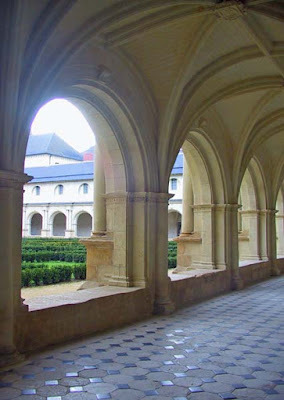 This is the last (for now) of my posts about the abbey at Fontevraud. It's been real fun! I do need to get back there one of these days to take some more photos. The abbey and village at Fontevraud. 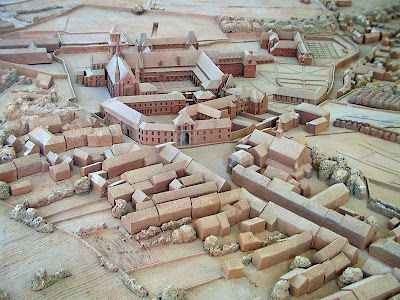 This is a model of the abbey grounds and the surrounding town that we saw in the entrance/gift shop. Being a student of architecture and city planning, I love models like this. I would build one if I were also a student of wood working. Alas, I'm all thumbs when it comes to precision wood cutting. I hope you enjoyed our foray into the medieval fun that is Fontevraud. I also hope that you get to visit the place if you haven't already. As I've said, it's really worth the trip. The buildings that enclose this courtyard outside the southeastern corner of the abbey's cloister date from the seventeenth century. They replaced the original twelfth century buildings that comprised the abbey's infirmary. The abbey infirmary and the Cour St.-Benoît. 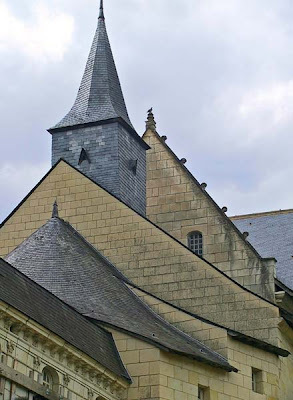 One side of the courtyard (not pictured here) is bordered by the chapel of St.-Benoît. It was in pretty bad shape when we visited, not yet restored. I don't know if it has been restored since, or if there are any plans to restore it at all. 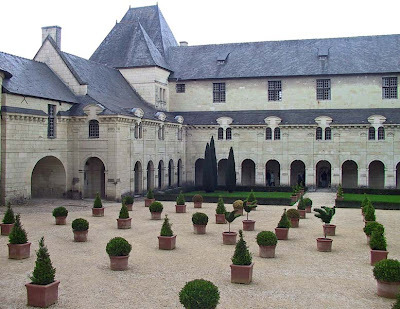 The infirmary, the chapel, and its courtyard are named for Saint-Benoît, who lived at the turn of the sixth century. He was an Italian monk and is credited with the founding of western christian monasticism. The Benedictine Order is named for him; Benedict being the English version of his name. The French name is Benoît, and his Italian name, of course, was Benedetto. By the way, in French, Joseph Ratzinger is known as Pape Benoît XVI (Pope Benedict the Sixteenth). Bénédictine, the sweet herb liqueur, is so called because it was invented at the Benedictine Abbey in Normandy in the early sixteenth century. Curiously, there's no such thing as eggs Benedict (œufs Benoît?) in French cooking, although I did find a reference to œufs bénédictine, a dish of salt cod purée and a poached egg on toast, topped with a hollandaise sauce, of course. Wikipedia says it was likely a dish prepared during Lent (no meat) dating back to the fifteenth century. I can imagine how content those monks must have been feasting on their poached eggs and fish, then capping off their meal with a little cup of bénédictine! Under the transept in the Fontevraud abbey church, you will see the funerary sculptures, called gisants, of Henry, Eleanor, Richard, and Isabelle. Who were they, you may wonder? Let's see if I can mangle a little bit of European history. 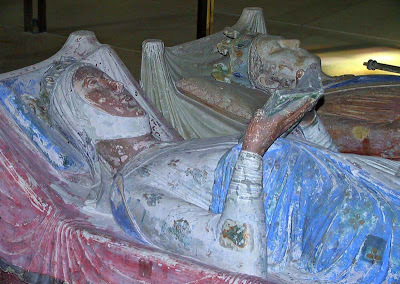 Eleanor of Aquitaine and Henry II Plantagenet. Henry was Henry II Plantagenet, King of England. Eleanor, his wife, was Aliénor d'Aquitaine. The Aquitaine is a large chunk of land in southwestern France and it belonged to her. She inherited it from her father, William X, Duke of Aquitaine and Count of Poitiers, a big muckity-muck and supporter of King Louis VI of France. Duke William died, supposedly from food poisoning, in 1137. He bequeathed his titles, land, and Eleanor's future to the French king, who swiftly married her (and her wealth) to his son. She was fifteen years old at the time. The groom became King Louis VII of France in the year of their marriage, and he and Eleanor later took off to fight in the Second Crusade. The family that fights together... Well, they got on each others nerves a lot and upon returning decided to have their marriage annulled. Louis got their two daughters; Eleanor got her land and titles back. Divorce in the middle ages wasn't always a bad deal. Eleanor set her sights on a dashing boy named Henry -- he was eleven years her junior -- and married him shortly after her annulment. Two years after their wedding, Henry became king of England, and the Aquitaine became part of the English kingdom. It was during this time that the English tourist industry discovered the Dordogne. It remains a popular destination for British tourists to this day. Alas, the décembre/avril romance soured and Eleanor plotted against Henry, siding with three of her sons, Henry the Younger, Richard, and Geoffrey, in a revolt against him. The revolt failed, but Henry was more than a bit irritated by the whole thing. He ordered Eleanor imprisoned in England to keep her from more mischief. It's good to be the king. Before all that nastiness, though, Eleanor and Henry had a total of eight children together. Among them were Richard I Coeur de Lion (Richard the Lionheart), who succeeded his father to the throne of England, and Jean d'Angleterre, also known as Jean Sans Terre (John Lackland), who succeeded his brother Richard to the throne. Isabelle d'Angoulême (buried in Fontevraud, remember?) was John's wife. That's all we need to know about her for now. While the lion-hearted Richard was king, he galloped off to the Holy Land to participate in the Third Crusade, leaving a regent behind to keep the throne warm for him. Bad brother John, who always thought he should be king since he was daddy's favorite (he wasn't one of the rebel sons), apparently attempted to overthrow the regent while Richard was away. There was also that unfortunate kidnapping-for-ransom thing in Austria that delayed Richard's return. John's not-so-subtle attempts to grab the English throne during Richard's time away actually gave rise to the legend of Robin Hood, enemy of Bad John, loyal to the absent King Richard, Hero of the People and All Around Swell Guy. So swell, in fact, that upon his release and return to England, Richard felt sorry for John because of his inability to actually seize the throne, forgave him, and named him as his rightful heir. John indeed became king after Richard's death, but not surprisingly he wasn't very good at it. He had a bad attitude and tended to piss people off. His general lack of skill as a politician and a diplomat resulted in, among other things, the ceding of most of England's holdings in western France back to the French king, who graciously allowed the English to continue visiting the Dordogne (although they were forced to stay in tiny hotels and share bathrooms). John also signed the Magna Carta, the beginning of the end for the great monarchies of western Europe. What a maroon! King John was punished for all of his ineptitude by being buried in England, instead of with his wife and parents in France. I'm just kidding about the punishment part, but he really is buried in England. Worcestershire, actually. Where the sauce is more famous than the king. That's why there's no gisant of John in the abbey at Fontevraud. And that's the truth. Sorta. There isn't a lot of intricate, over-the-top stained glass in the abbey. I'm not sure if this is typical of abbeys or not. I suspect it might depend on several things, including the specific taste of the people in charge, the financial state of the order, and whether the original glass was destroyed and replaced. Clear, but blue-tinted, glass high on the church wall. These are the only photos of the glass at Fontevraud that I took on this particular visit. And as you saw in yesterday's post, the church is brightly lit by daylight, meaning that most of the glass is like this. 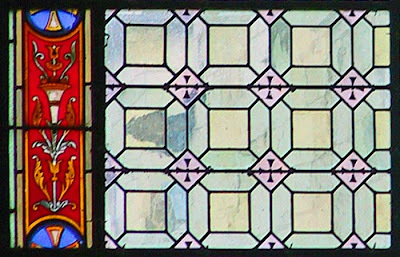 A window section, again with very clear/pale colors. 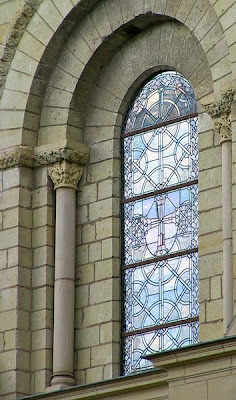 Compare these windows to those in other churches, la Sainte-Chapelle in Paris for example, and you will see that the difference is rather striking. The interior of this spectacular church has been restored in recent years. I say restored, but I'll wager that the interior was never this austere when the church was younger. The stone is brilliant white, and the light streaming through the windows is just as bright. It's an interesting effect. 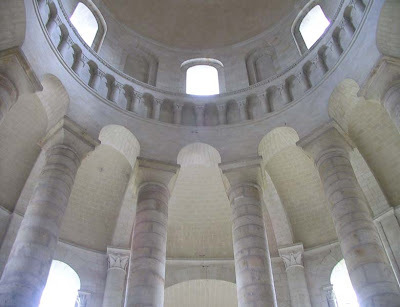 The apse, or chevet in French, at Fontevraud. I don't remember that there were many people there. It was September, so the summer crowds had thinned out a bit. Still, the weather was pretty good. I didn't have the same camera I have now. I was using one of Ken's, and I wasn't very experienced with digital photos. 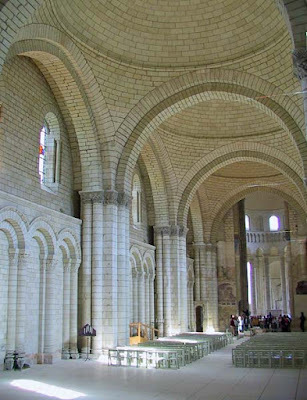 The nave, called le nef in French. Nonetheless, these came out ok. I think digital is much more forgiving than film photography. Then there's all the correction you can do on the computer to crop out stuff or fix a slanted picture. 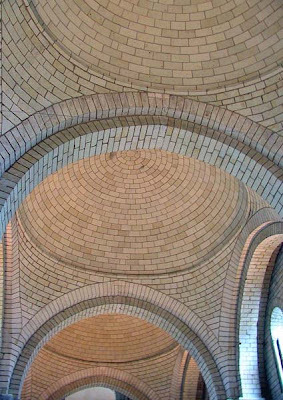 Domed vaults over the nave. I'd like to go back one day with my current camera and tripod. Any takers? 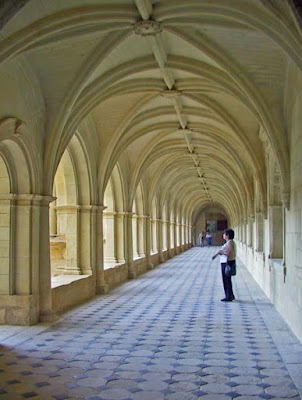 The abbey at Fontevraud has an impressive cloister. It's quite large and the stone work is impressive. It's called la Cloître Sainte-Marie. Cheryl admires the cloister garden from the northern gallery. According to my Michelin Guide, three of the four galleries are covered by renaissance vaults, while the fourth is gothic in style. A peek at the garden through the arches. These pictures were taken in 2003 on a visit with our friend Cheryl. We still had our shetland Collette back then, and dogs are not allowed inside the abbey. Since Ken and I had seen the place before, he stayed outside with Collette -- having a glass of wine or two at a café in town -- while Cheryl and I walked through the abbey. What a noble sacrifice! I think we spent about an hour wandering around and taking pictures before heading back out. 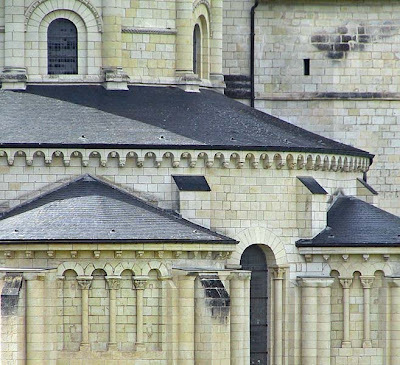 These are images of the Abbey at Fontevraud, near Chinon in the Loire Valley. The place is well worth a visit if you're in that area. It's quite a distance from us, though (about 2 hours by car), so we don't get over there often. 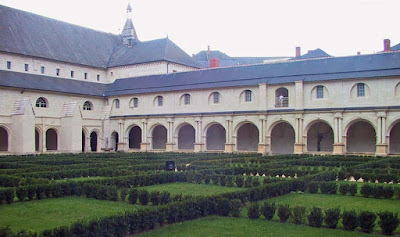 Fontevraud might be best known as the final resting place of King Henry II Plantagenet, his wife, Eleanor of Aquitaine, and one of their sons, Richard the Lionhearted. I think that, at least, parts of their bodies are buried there. When Henry was King of England, he spent a lot of time at Chinon. If you've seen the film "Lion in Winter," Chinon is where it takes place. Sweeping, curvy roofs, with columns and arches. The abbey church itself, originally built in the twelfth century, has been spectacularly restored, as has the entire complex. The cloister is magnificent. There is so much to see. For now, I'll tease you with some of the exteriors. 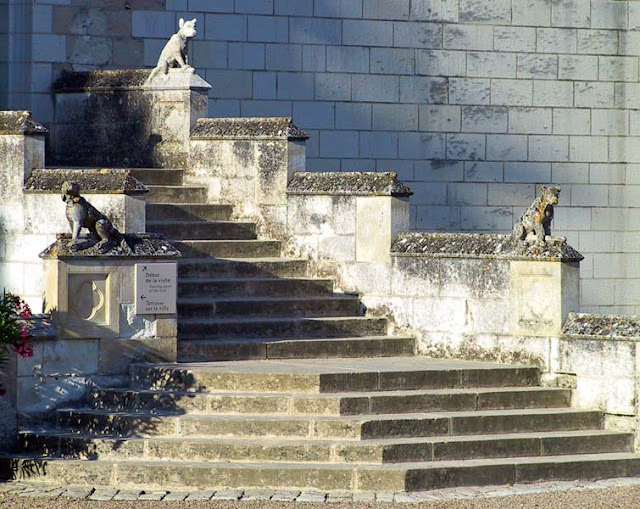 You can find these very life-like dogs guarding the entrance to the Renaissance château at Loches. The statues are apparently a commemoration of the many hunting dogs belonging to the kings who used the castle as a hunting "lodge." Three of the four dog statues on the steps of the castle. Loches is very close to St. Aignan (some say as close as twenty minutes by car, but I dispute this) and we've visited it many times. It's a great town, and the medieval and renaissance castles on the heights of the old city are a lot of fun to visit. I took this picture in 2003 on one of our first visits to Loches with our friend Cheryl from California. What we call a church spire in the US is called une flèche in French. We might also call it a steeple. In France, churches can have belltowers and spires in different places. La flèche on Notre Dame de Paris. 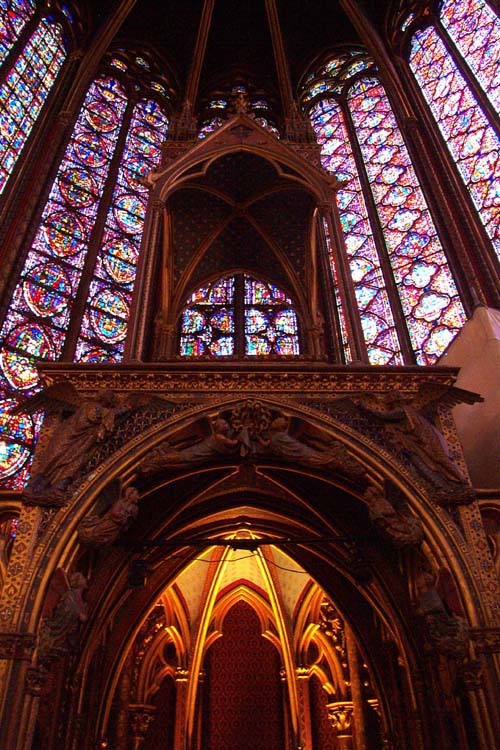 On gothic cathedrals, for example, the belltower or towers are usually at the front entrance to the building. They can be topped with a spire (like at Chartres) or not (like at Notre Dame). 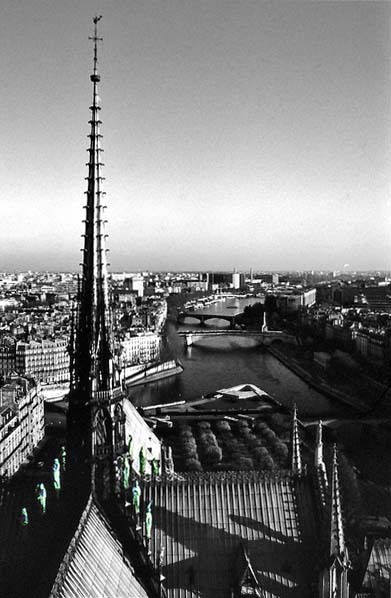 At Notre Dame in Paris, the spire, or flèche, is perched atop the transcept. This is one of many pictures I've taken from the belltowers at Notre Dame. In this one, I removed the color, except for the statues below the spire, and increased the contrast a little. I missed one of the statues on the roof but didn't notice it until it was too late. Did you notice? With the rain and wind of the past few days, there aren't may leaves remaining on the vines or the trees. These are from our prunus tree in the yard, taken last week. 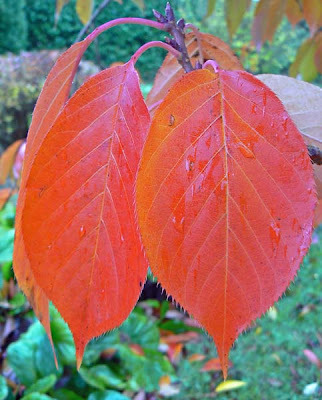 The prunus tree turns bright red in the fall. Today is a national holiday in France. November eleventh marks the anniversary of the end of World War One in 1918. In the US, we celebrate it as Veteran's Day, but not to the extent that they do in France. On a trip to the supermarket the other day, Ken and I decided to pick up a couple of cheeses. From the refrigerated case. We don't have a cheese shop in Saint-Aignan, but there is a cheese vendor at our Saturday market. 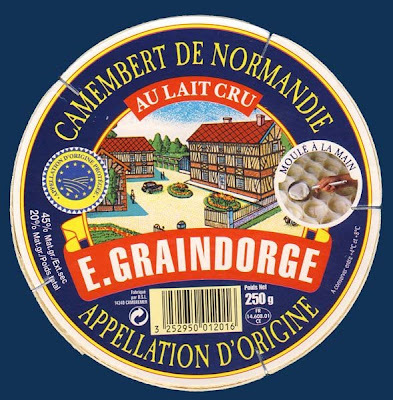 A Camembert from Normandy, made with raw milk. The cheese vendor's prices are on the high side, but they have some very good stuff. One cheese we often get at the market is Parmesan. It's pricey, but it's the real stuff from Parma and is not often available in the grocery store. But, if you know what to look for, you can also find some very good stuff in the supermarket for less. Like these two cheeses from Normandy. Camembert is ubiquitous in France, but you need to open up the box and lightly press the cheese (it's wrapped in paper) to gauge its ripeness. 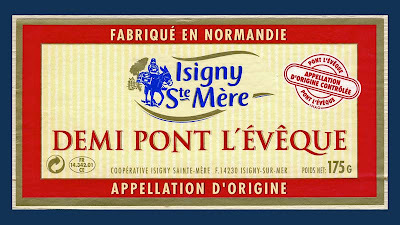 The same goes for Pont l'Evêque. An A.O.C. Pont l'Evêque. Demi means half; this cheese is normally square. Of course, at the market, the vendor will select a cheese for you if you tell her what ripeness you like, and normally you will see the cheese without a wrapper, but you usually can't touch it. Seeing it is often enough to judge ripeness when you've been buying cheese for a while. The leaves are now almost all on the ground. But there are still a few apples clinging to the trees. They'll be gone, too, in a short time. Holding on for a while longer. This, one of five apple trees in our yard, is often the last to lose its leaves, not to mention its fruit. They're not apples that we eat because they're rather small and very tart. 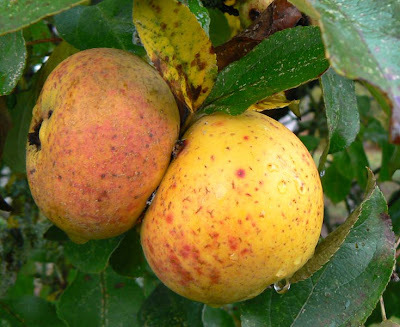 In the fall they turn from green to yellow -- maybe that means they're better to eat? I don't know. This past week has been very wet, with a good amount of rain and a lot of fog. 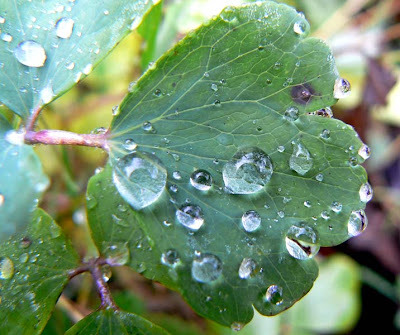 In the morning, everything is covered in droplets. 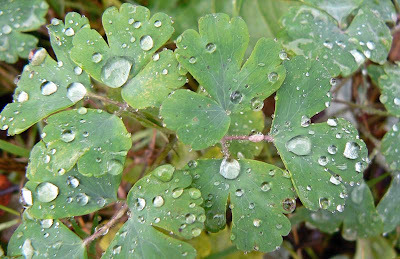 This is a photo of columbine in our yard, with the requisite dew. What I think is columbine, covered in dew drops. I think it's columbine, anyway. As far as I can tell, it's aquilegia vulgaris in Latin, or ancolie des jardins in French. Maybe my favorite taxonomist (you know who you are) can help me out here. I've tried to propagate it from seed to no avail. The flowers it puts out in spring are wonderful shades of pink and purple. It's a great plant to have, and I'd love to spread it around if I can. 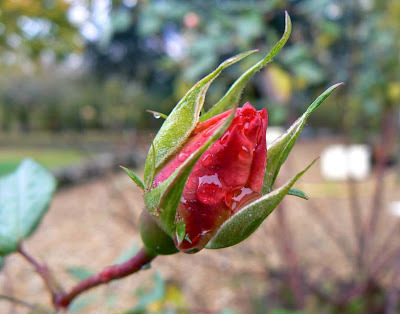 A November rosebud races against the weather to open. Man, does it feel great to type that! Ken and I stayed up all night through the returns and the speeches. The emotions, wow. I had tears streaming down my face on several occasions, and Obama's speech was amazing. Now it's time to bask in the glow for a bit. 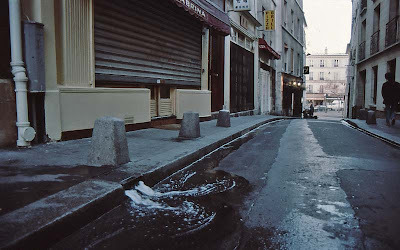 One of things that struck me the first time I was in Paris (1981) was the constant street cleaning going on. I came from a small city where the streets were cleaned once a week. That seemed to be enough. But in Paris, the streets are constantly being swept, as are the sidewalks, by people with brooms and people on funny looking machines (San Francisco recently bought some of the sidewalk sweepers from the French manufacturer). The water flows on a Paris street. I believe this is up behind the Panthéon somewhere, maybe looking toward la Place de la Contrescarpe. Not sure. Also, twice a day, valves are opened up which send water flowing along the curbs, washing all manner of dirt, grit, and litter into the street drains. In many parts of town there are crews of city employees with brooms, helping to manage the flow and unblocking any little dams that form. If you look closely (but not in this picture), you may also notice that there is often a little rag barrier near the valves that the sweepers move around to send the water first one way, then another. The running water is just one of those things that is so Parisian to me that I had to take a picture of it. Unfortunately, my picture isn't so great. But with Photoshop, I've been able to make it somewhat presentable.